ArtPrize anticipates that over 1,000 volunteers will seize the opportunity to welcome more than 500,000 visitors to Grand Rapids for the ninth annual event. GRAND RAPIDS (Michigan) August 8, 2017—ArtPrize, the independently organized art competition recognized as the world’s largest annual public art event, announced 2017 registration details for its Volunteer program, presented by Lake Michigan Credit Union. ArtPrize seeks volunteers—who through their energy and commitment provide the framework essential to the visitor experience—to join the 1,000 plus individuals who collectively work nearly 4,000 shifts and upwards of 12,000 hours of service each year, while welcoming visitors from near and far to the event this fall. The ArtPrize Volunteer season will officially commence at the annual Volunteer Kick-Off Party on August 10. ArtPrize Nine is slated to take place in Grand Rapids, Michigan from September 20–October 8, 2017. Volunteers help visitors to navigate through the event with ease while experiencing everything ArtPrize has to offer. Whether it be as individuals, groups, families or friends, volunteers bring the community together with their willingness to devote and share their time with ArtPrize. Online self-registration opens Friday, August 11, allowing volunteers to sign up and register for shifts that will suit their interests and availability. The volunteer program has added ongoing training modules for volunteers in 2017, allowing volunteer registration to stay open throughout the 19-day event. This replaces the previous system of incorporating a cut-off date for shift sign ups. Volunteers and community members are invited to join the ArtPrize staff in celebrating the beginning of the ArtPrize Nine season at the Volunteer Kick-Off Party, held at 200 Monroe Avenue from 6 to 8 p.m. Friends and supporters of ArtPrize will enjoy music, food and activities throughout the night. Information about what is to come for ArtPrize Nine this season will be highlighted as well as the opportunity to learn about specific volunteer opportunities and sign up for a volunteer account. Volunteers must take part in a training session prior to their shifts. In-person training sessions will take place the week after Labor Day, offering weekday, weekend and evening options throughout the week. In addition to in-person training, volunteers are also given the option of learning through a series of online orientation videos. Through training, volunteers will hear from ArtPrize staff and partners on the event’s history, how it works, and specifics about shifts and what to expect during the event. 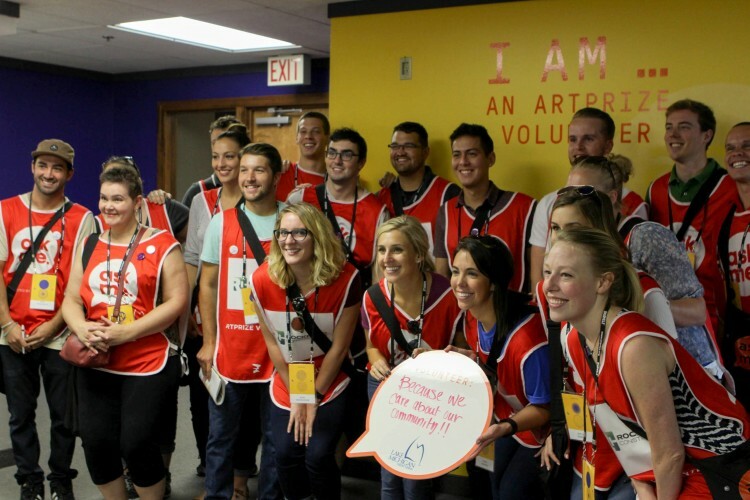 This will provide new and returning volunteers with a strong foundation so they are fully equipped to provide assistance throughout the course of ArtPrize Nine. There are an array of volunteer opportunities available during ArtPrize Nine to fit everyone’s interests and schedules. Wayfinders, stationed around the ArtPrize district, serve as ArtPrize tour guides and ambassadors of downtown Grand Rapids. Equipped with guides and resources to welcome visitors, they provide directions, answer questions and promote activities and Venues in the surrounding area. Education volunteers assist with family events, activities and school programs - with positions ranging from lead docents to facilitators in our drop-in art studio spaces and STEAM Village. Some volunteer opportunities may require additional training. A full listing of volunteer opportunities can be found at artprize.org/for-volunteers. Volunteering to host an artist in your home can be an equally rewarding opportunity. With nearly 30% of artists coming to ArtPrize from locations outside of Michigan, the Artist Hosting Program has become a crucial aspect of the ArtPrize experience for artists visiting from out of state or another country. Whether it’s just for a few days or for a longer stay, by hosting an artist volunteers make it possible for artists to experience ArtPrize. Previous award winners who took advantage of the temporary housing arrangements include Stacey Kirby, Beili Liu, Mia Tavonatti, Adonna Khare, Young Kim and Anila Quayyum Agha. Interested volunteers are encouraged to email the ArtPrize team at exhibitions@artprize.org for more information. Volunteers will enjoy a variety of benefits for dedicating their time to the event including: a free event guide, a Metro Pass—good for 10 free rides on The Rapid’s fixed routes and unlimited use of the Silver Line during the event—access to the Volunteer Lounge at the ArtPrize HUB/HQ, access to volunteer-only events and weekly raffle entry for prizes. Volunteers will enjoy discounted ArtPrize merchandise for every three shifts completed and a special “fifth shift” gift for completing five shifts throughout the 19 days. Additionally, ArtPrize Nine volunteers will be offered a discount on pre-sale tickets to the Ninth Annual ArtPrize Awards—including the Ceremony, powered by the DTE Energy Foundation, and the official after party, details to be announced soon. Volunteers will also be given an exclusive ArtPrize Nine word poetry magnet set. For more details on the ArtPrize Volunteer Program and how to register, visit artprize.org/volunteer. ArtPrize Nine is slated to take place September 20-October 8 in downtown Grand Rapids, transforming three square miles of downtown Grand Rapids into an open playing field where 1,346 entries at 176 venues will vie for a combination of public vote and juried awards totaling $500,000 in prizes.